Philosophy has followed most other academic disciplines in seeking to make both its public voice and public value clearer and more explicit. Arguably philosophy has greater resources to draw on, given the deep civic roots of the discipline. In recent years, the American Philosophical Association formed a committee on public philosophy, following most other U.S. professional disciplinary associations in forming a committee intended to support and develop the public dimensions of the respective discipline. More recently, a group of philosophers founded the Public Philosophy Network (PPN), an association dedicated to the promotion of publicly engaged philosophical research, social action projects, and teaching…. How has the discipline of philosophy experienced a disconnection from public life and narrowing of its public role? How does public philosophy fit into the larger emergence of public forms of scholarship across disciplines? What are the core characteristics of public philosophy? How does public philosophy differ from applied philosophy, scholar-activism, and other more familiar approaches? What does publicly engaged philosophy have to contribute to addressing the public dimensions of complex public issues? [Meagher proposes] five theses intended to provoke further reflection and discussion…. I think the hardest part of this for many philosophers, along with other academics, to get are theses one and two, namely that engaging the public may call on us to change how we do our work and that the relationship should be mutual, not hierarchical. However slowly, this is beginning to change, especially as more philosophers enter unfamiliar territory, from teaching in prisons to working with NGOs on issues of climate, poverty, race, and gender. I am only now catching my breath — in between teaching and before I head off to my next conference — to stop and reflect on the Public Philosophy Network’s first conference. Never mind the bias that I was a co-chair. I just helped throw the party. But the party glittered because of everyone who really helped create it. It was fabulous, with participants ranging from graduate students doing amazing public philosophy work via youtube (e.g Cori Wong) and in poetry slams in NYC (Travis Holloway) to renowned philosophers working on climate change and poverty (Thomas Pogge and Henry Shue) as well as journalists E.J. Dionne and Hannah Rosen, political theorists Bill Galston and Mark Sagoff, Penn State’s Anita Allen, and more than a hundred other amazing people. Here are some of my notes, which I also posted here. We had roughly 150 people registered and, in the midst of the conference, reached a milestone of having 500 members in the network. The most exciting thing about the conference was its participatory nature, with one full day of collaborative workshops followed by another day of interactive panel sessions. On the workshop day, I attended Vance Rick’s and Mark Fisher’s workshop on social media and ethics. It was lively, especially with lots of great provocations from participants about the need for both walls and bridges in cyberspace and how to maintain both at the same time. In the afternoon I attended Chris Long and Cori Wong’s session on philosophy and the digital public. This session was a little more formal, with both organizers giving short presentations. Both were followed with great conversation. And in the end we tried to create a social media product and learned a lot about the fruits of collaboration. Altogether there were 15 workshops the first day, and I heard great reports all over. The next morning I facilitated a plenary on the outcomes of that workshop and pushed my own pet concern to interrogate the meaning of “public philosophy.” We heard from people who took part in lots of workshops, including philosophy in the city; collaborative research; academics stand against poverty; and feminist bioethics. The rest of that second full day was taken up with panels, which, at their best were highly participatory. I really enjoyed the session on “eating in public” put on by an interdisciplinary team at Michigan State University. Actually, this was a presentation of a paper written by four authors. Each took five minutes to explain his or her own aspect, then for the Q&A they turned the table and asked the audience questions. At the end of the day I attended a session organized by Elizabeth Minnich that asked wonderful big questions about what we have all learned from doing this kind of work. The panelists started but then the question went all the way around the room. In short, this conference modeled a new way of thinking about philosophy. It was not at all an exercise in “applied philosophy.” It was an exploration of engaged philosophy where we could all think about what is public in our work and what being public means for doing philosophy. October, 6-8 2011, Washington Plaza Hotel, Washington, D.C. The Public Philosophy Network invites proposals for a Fall 2011 meeting on Advancing Publicly Engaged Philosophy. The conference will include a mix of formal and informal sessions on various issues in practical philosophy, including concrete projects and political problems as well as discussions of larger philosophical questions about how to engage in philosophical activity outside the academy. Please submit formal proposals (350-500 words) or informal suggestions for any one of the following formats by April 30, 2011. Workshops. These sessions will be held the first full day of the conference and will include a mix of presentations and discussion on either substantive policy issues (for example, climate change, gay marriage, housing policy, welfare, etc.) or practical matters and best practices in public philosophy (for example, tenure hurdles for publicly engaged work, collaborative work, outreach programs in prisons, sources and methods for funding, etc.). Proposals should explain the nature of the interest area of the participant and how it is of concern to philosophy or public life. Identification of community-based practitioners who might be interested and able to participate in particular workshops is welcomed. Table Sessions. These more informal, round table sessions will occur over lunch during the conference and are intended for discussion of issues that are less developed. To propose a table session that you would help organize or lead, send a succinct statement of the problem and some ways in which philosophers could engage it. Again, suggestions for community-based practitioners who might be interested and able to participate in particular workshops are welcomed. The organizers will select a range of these sessions and assign tables for the conference; participants will also have the option of organizing table discussions during the conference. Paper Presentation. Proposals are welcome for presentations on any area of philosophy relevant to public policy, advocacy, or activism, presentations which document past and ongoing projects in publicly engaged philosophy, or take up more theoretical questions on how to do publicly engaged work. Organized Panels. Panels may be proposed on any number of themes: Book sessions, philosophical issues in public philosophy, or policy problems and how philosophers may engage them. These sessions could include a traditional set of three papers followed by discussion or more informal brief panelist remarks followed by interactive discussion among panelists and the audience. Proposals should include names and affiliations of proposed panelists, the proposed format, and an abstract of what will be addressed. In addition to taking up pressing political problems, conference-wide sessions will address larger questions in public philosophy: In what ways is philosophy, when engaged with various publics, transformative, i.e., how can or does philosophy improve public life? In what ways is philosophy transformed when engaged with various publics, i.e., how can public engagement inform philosophical concepts and understanding or alter disciplinary boundaries? And, if public philosophy is valuable—then how might we promote and sustain its practice? 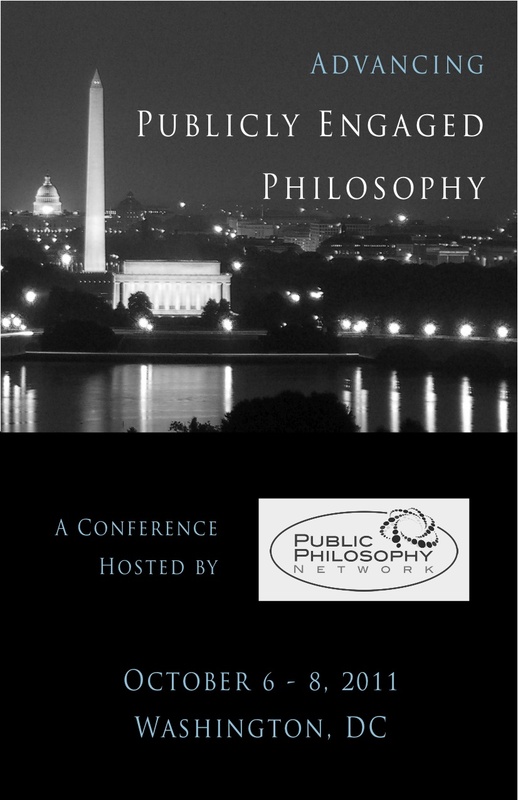 To submit a proposal, go to: http://publicphilosophynetwork.ning.com/page/conference-submissions. The deadline is April 30, 2011. Also welcomed are informal suggestions for possible workshops and table sessions. Participants may submit proposals for participation in workshops as well as either paper or panel sessions. Volunteers to chair sessions or serve as discussants are also welcome. The conference is co-sponsored by the American Philosophical Association, George Mason University’s Center for Philosophy and Public Policy, Michigan State University’s Kellogg Chair of Agricultural Ethics, and Pennsylvania State’s Rock Ethics Institute.